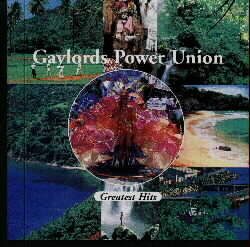 Gaylords Power Union's Greatest Hits have long been overdue with some of the most powerful Caribbean Classics of Calypso,Creole, soul, pop, spouge and reggae. 34 Memorable tracks on 2 Cds from one of the most scintillating show bands ever to grace a Caribbean stage. The reggae tune "HIT ME WITH MUSIC" remained at the top of the charts for many weeks in Jamaica and Barbados in the 1970's.. This repertoire is a fine addition to your collection. The Gaylords have appeared at the 7th annual World Creole Music Festival in Dominica, Nov 1, 2003. "Lovely Dominica" is one of the popular hits.